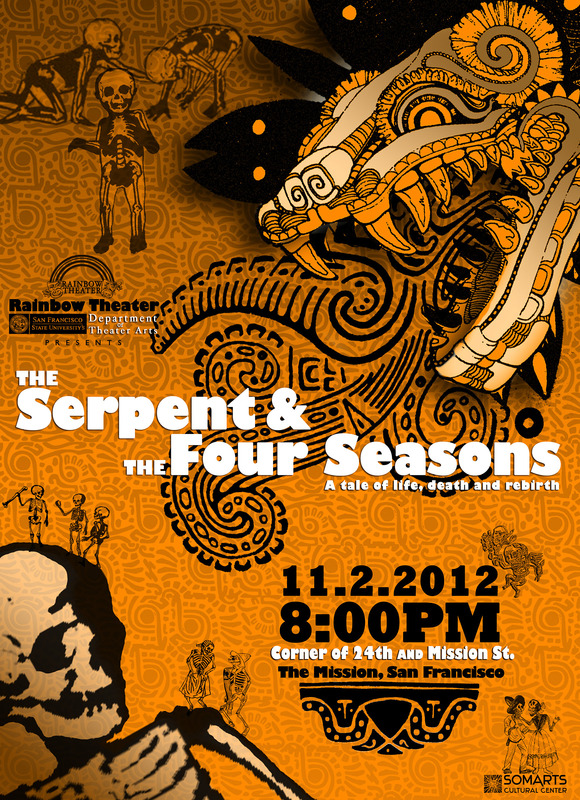 “The Serpent and the Four Seasons,” a multimedia student production, will be presented tonight outside the 24th Street BART station in celebration of Día de los Muertos. The show is a combination of dance, theater and music produced by San Francisco State University’s Rainbow Theater. Written and directed by theater arts professor and Mission resident Carlos Baron, the show will be performed by a group of 14 students from the university’s Latino/a Teatro Workshop. It was created with help from choreographer Adriana Sánchez, musician Maestro Miguel Martinez and actress Saday Osorio Córdova. This is the third year in a row that Rainbow Theater has participated in Día de los Muertos, but the first time the company has performed in public, on a stage built specifically for the occasion. Ten students from SF State’s Broadcast and Electronic Communication Arts and Theatre Arts departments are providing technical work and support. The free performance begins at 8 p.m.